Through many years of history, experience, and practice, martial artists realized that in a fight, there are generally three factors that determine victory. Through many years of history, experience, and practice, martial artists realized that in a fight, there are generally three factors that determine victory. They are speed, power, and techniques. You cannot neglect any one of them, and training one should not be detrimental to any of the others. Speed is the most important factor in winning a fight. If you are faster than your opponent, then you have better access to attacking vital, sometimes fatal, areas on the body. Even if you have a limited amount of power and techniques, you still have a good chance of inflicting serious injuries on an opponent if you know where and how to strike. Strikes to vital areas, such as the nose, eyes, groin, and throat, do not require much power to be an effective attack or to stun your opponent. With an advantage in speed, you will also be able to more easily evade any attacks and counterattacks made by your opponent. Having the upper-hand in speed means you will be able to effectively create opportunities to strike and retreat before your opponent has a chance to react. If you already have speed, then what you need to build up next is power. Some opponents will win by brute-force, by simply being muscularly stronger and more fit than you. Even if you are able to strike a vital area, it is possible that an opponent might still be able to withstand your attack or quickly recover from it. Also, if your arms, hands, and legs are weak, it is possible for you, as the attacker, to get injured, by hitting a target that is physically tougher than your striking arm, hand, or foot. Effective fighters cannot rely on just speed and techniques alone. Speed and power are priorities in a martial artist's training curriculum as they constitute a well-rounded fighter's physical advantages. They make up the foundation of overall effectiveness in all Chinese martial arts styles. 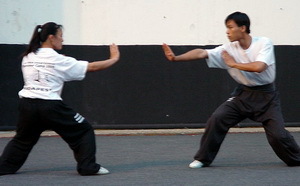 After speed and power, then the third most important factor is learning and applying techniques, which includes methods of intercepting attacks, proper footwork, accurate form in kicks and punches, fluidity in body motions, sequential moves, and different types of kicks, punches, throws, and Qin-Na. Training techniques also includes incorporating the use of sound fighting strategies. Remember that all techniques from any style must follow certain basic principles and rules in order to be good techniques. For example, all offensive and defensive techniques must take into account how exposed and vulnerable your own vital areas are when executed. Now with this understanding of speed, power, and techniques, we can begin to analyze how these three factors are prioritized. You may have met or know of skilled martial artists who were defeated by people with no martial arts or fighting background whatsoever. Sometimes the martial arts community is ridiculed because of it. How does this happen? Oftentimes, such a case is simply an example of prioritizing techniques over speed and power. It does not matter how many dozen different kinds of jumps, punches, kicks, throws, and Qin-Na techniques you can do. If it takes half a second too long for you to execute a technique or to react, your opponent will most likely strike you first. Half a second is really all it takes, if not less. Similarly, if your attack lacks power, your opponent might simply brush you off and retaliate. If all your attacks are ineffective, you will eventually tire out and lose the fight. Let's take the converse scenario where you have better speed and power but very little in techniques. Even if you execute a technique poorly, you would most likely be able to make up for the error through speed and power, whether it be by being fast enough to retreat from incoming danger or by being strong enough to endure unexpected impact to your body. In many cases, knowing and applying complex and refined techniques is only useful against opponents who effectively execute similar techniques against you. Such techniques are almost always unnecessary otherwise, especially if you are mainly concerned with just winning a fight against an ordinary opponent. Conditioning your body is a big key to success in your practice and training. Traditional Chinese martial arts training involves much diligence in purely conditioning your body's physical power and speed. About 80-85% of a practitioner's training will be in conditioning and self-practice. There is actually only about 15-20% of actual learning. It is very important, however, to know your body's limitations and not exceed them to the point of injury. Every individual's body is different, containing different strengths and weaknesses, so it is likely that every individual's training program will differ to accommodate such factors. As an example, a blacksmith would probably have very strong arms to begin with and can expect to develop arm strength in maybe half the time that it takes for an ordinary practitioner. If ordinary practitioners try to follow the same training schedule, it is possible for them to injure their arms by overstraining them. Conditioning is a long, gradual process often taking many years, and you must learn to condition accordingly to your own individual body, not to anybody else's. Patience is a requisite. However, you also cannot be too passive and overly careful in your training, otherwise your body will only maintain itself and not progress. Know how to push your limits so that you can improve yourself, but also know what is pushing too much to avoid injuries. Injuries are especially harder to heal as we age, and we must be careful to treat them immediately and appropriately when they occur. In ancient times, there were many herbs and special medicines, in addition to acupuncture, acupressure, and massage, to help the body rebuild its strength during the recovery process. Keep in mind, though, that injury prevention is the best protection and way of training. There are many injuries that never truly heal 100%. Read Part 2 of Martial Arts Conditioning and Fighting.